It is officially barbecue season and I love nothing more than both hosting and attending them. So, when I recently received an invite to one, it was a give-in that I would be going. The host had asked that each attendee bring a dish along, but when I asked what, the response was the dreaded “anything.” Potato Salad is certainly not a safe choice, as it is generally one of the most popular dishes at such an event. 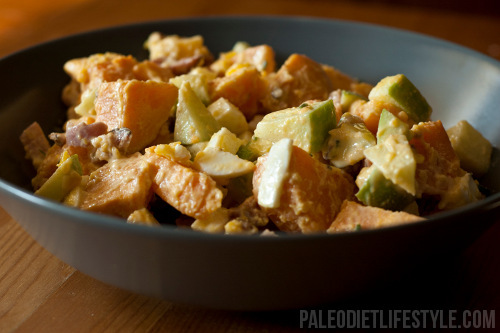 However, I consider my Sweet Potato Salad unlike any other. This dish combines all flavors, from the sour of the lemon juice, the sweetness of the apples, to the saltiness of the bacon. As much as this can be a fairly flexible recipe, there are two things I would take note of. Green apples like Granny Smith apples trump any other of its kind in such a dish. The main reason is because of how crisp they are. The texture of the potatoes and eggs are quite soft and I find it important to have something firmer to create a balance in terms of texture. The sourness of this type of apple also adds for a great bite. The second thing is to not get a cut of bacon that is too lean. The fat from the bacon makes it that much more flavorful, and this flavor is not something that can be easily substituted for. Other than being absolutely delicious, this salad is also very easy to prepare and packed with very nutritious ingredients like eggs and bacon. Don’t forget to choose a good quality and natural bacon without any added sugar or preservatives. Good butcher shops usually carry or make their own natural bacon. In a large saucepan over a medium heat, add the sweet potatoes cubes, fill with water and bring to a boil. Cook until tender. Meanwhile, in a small skillet over a medium heat, fry the bacon bacon until crispy. To hard-boil the eggs, place them in a sauce pan covered with cold water. Bring to a boil over a high heat and then reduce the heat and let simmer for 10 minutes. After the 10 minutes, drain the hot water and run some cold water over the eggs to rapidly stop them from cooking. After the eggs are cold enough to handle, you can peel them and chop them. In a small bowl, combine all the dressing ingredients. Mix thoroughly. In a large bowl, combine the cooked potatoes, eggs, apple and bacon. Top with the dressing. This salad provides for a great side to complete any dish. Enjoy!